My younger sister, while an accomplished pianist and singer, was not especially blessed in the art of cookery. 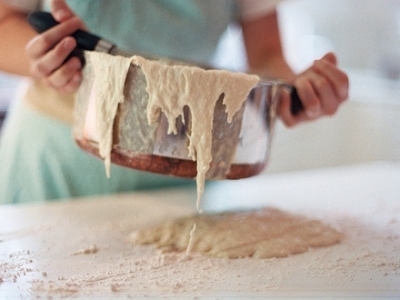 In fact, I’ll never forget her first attempt at baking. One day while our mom was at work, Sis thought she’d surprise everyone that evening with a freshly baked cake. The recipe Sis chose was from a community cookbook our mom had that was published in 1950 by an Amarillo radio station, and included a recipe for Aunt Mattie’s cornbread and Mom’s hot rolls (the joke was both recipes were submitted by my aunt, as my mom didn’t make rolls). Unfortunately many of the recipes were difficult to understand because of the publishers use of a dash rather than a forward slash when writing numerical fractions. So when Sis, a young girl in high school, got to the part calling for “1-2 dozen eggs, separated,” she read it as one to two dozen eggs and thus added about a dozen more egg whites than the recipe called for. When mom arrived home, she smelled the cake just beginning to bake and quizzed Sis about what was cooking. Sis proudly announced she was making the family a cake for dinner. Now the kitchen and den of our small house was separated only by a stovetop island that also contained a wall oven. So as mom sat in the den watching television she began hearing noises coming from the kitchen. Blub! Blub, blub! Gurgle, blub! Gurgle! When she investigated the origin or the noise, mom discovered the cake bubbling, blubbing and running over just as in one of those slapstick movie scenes. After cleaning up the mess, everyone including Sis got a good laugh out of the situation. However, that experience ended my sister’s culinary ventures for years afterwards. Sis eventually met and married an Arkansas farm boy who, in addition to other fine qualities, was an extremely talented cook. And over the years under my brother-in-law Larry’s tutorage Sis began to hone her cooking skills. Then one summer day in 1978 at a family get-together, Sis presented her contribution to the meal–a scratch-made Hummingbird Cake, which until then no one had ever heard of. The cake was absolutely delicious, more than making up for what had become known as her Three Stooges cake. 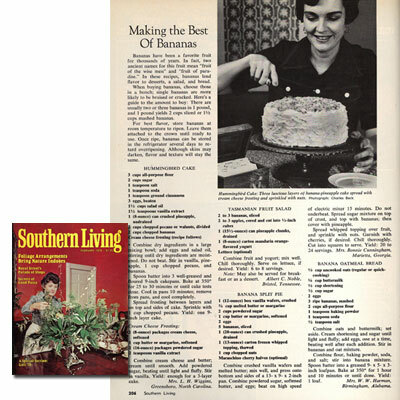 The recipe for Hummingbird Cake was first published in the February 1978 issue of Southern Living magazine, submitted by Mrs. L. H. Wiggins of Greensboro, North Carolina. Following its printing, Mrs. Wiggins’ cake recipe won numerous awards and accolades including the Favorite Cake Award at the Kentucky State Fair in August of 1978, and Southern Living’s Favorite Recipe Award in 1990. 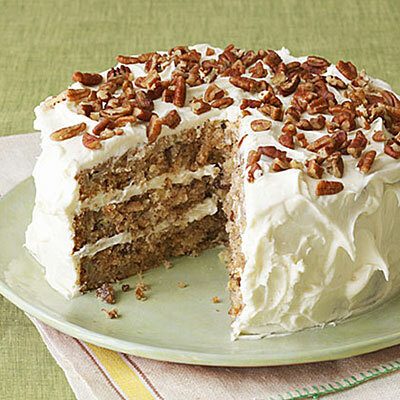 In fact, the Hummingbird Cake recipe became the magazine’s most requested in its forty-eight year history. There has never been an explanation for how this delicious banana layer cake with pineapple, pecans, and cream cheese frosting got its name, but perhaps it stems from a sugary richness reminiscent of the sweet nectar hummingbirds feed on. And it’s this richness that allows for small portions, making it perfect for parties, weddings, and other large gatherings. The Hummingbird Cake is also easy to make and stores extremely well. 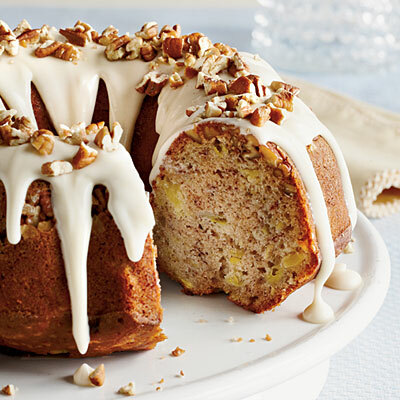 Throughout the years, there have been a number of versions and variations of this popular cake–a light version, an organic version, recipes using walnuts instead of pecans, and the incorporation of other fruits. In fact, one poll taken several years after the recipe was first published not only resulted in more than seventy-five variations in ingredients and methods, but in its name as well: Never Ending Cake, Nothing Left Cake, Jamaican Cake, and Granny’s Best Cake. But the name that fits this cake the best, the one that best describes its delicious goodness, the name that best tells what happens each and every time my sister brings this cake to a party or social get-together, the cake that turned her into the family’s favorite baker is . . . The Cake That Doesn’t Last. NOTE: This story is lovingly dedicated to my sister – Happy Birthday, Sis! This entry was posted in Uncategorized and tagged Cake, childhood, Sister by grubamericana. Bookmark the permalink.